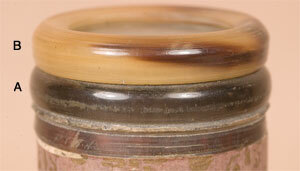 At the top of the field tube is a single plano-convex lens (dia=3cm) held in place by a tortoise shell retaining ring. The plano-convex lens (dia=3cm) at the bottom of the field tube is retained by a metal retaining ring. 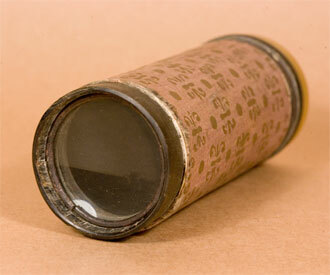 The field tube is constructed of dark wood (possibly lignum vitae) covered with paper and stamped with gold ornamentation. It is slightly waxy. 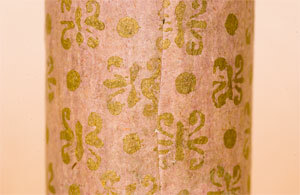 From the pattern at the seam (right) it is clear that the paper was stamped before it was applied to the field tube body. 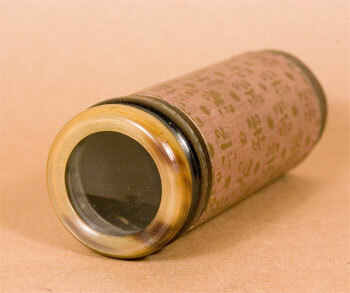 The top field lens is held in place by the tortoise shell retaining ring (B) that screws onto the lignum vitae tube (A).